We have had a long-standing working relationship with Love & Company. They have helped us achieve a consistent brand though our collateral materials, website design, direct mail campaigns and digital marketing. We look to them for their expert advice on event planning and even sales training. Love & Company has been instrumental in our success of maintaining a full census over the years and we are extremely pleased with the partnership we share. We began working with The Village at Heritage Point in 2003—four years after the community opened. Located in Morgantown, West Virginia, the community is sponsored by the local hospital system and offers both residential living and residential care services in a friendly, welcoming atmosphere. The Village historically maintains a strong census, but felt a need to identify their brand and build their wait lists. Love & Company has collaborated with The Village on many different types of projects throughout the years. We work together annually to create and implement marketing plans that boost lead generation, increase wait list members and promote sales. Each year has brought a new set of needs, and we adjust the budgets and projects accordingly to meet the unique requirements of a given year. Our initial project in the partnership with The Village at Heritage Point was a new set of collateral materials that introduced a cohesive brand identity and consistent messaging. 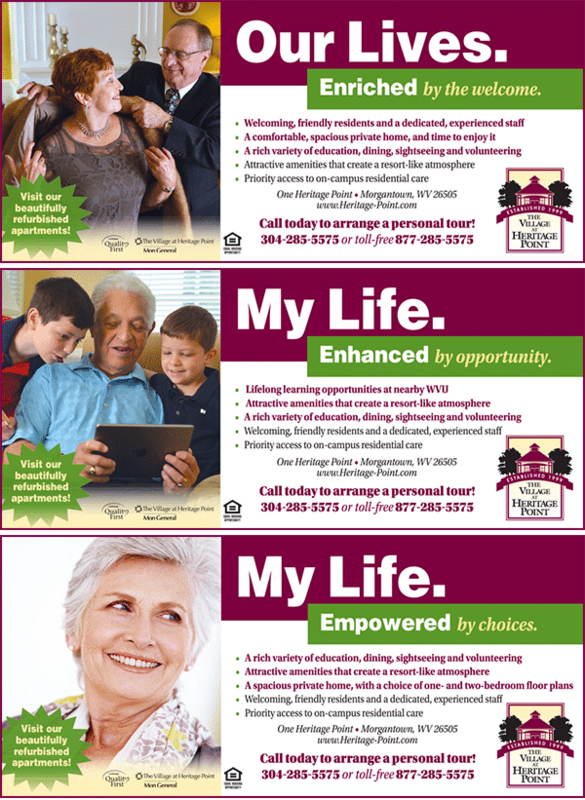 We continue to use the tried-and-true message of “inspired senior living in the heart of Morgantown” in all marketing materials to this day. We also update and refresh their collateral materials with new photos from bi-annual photo shoots, and new copy as needed to keep the pieces current. The Village at Heritage Point’s website was recently redesigned to create a more user-friendly experience. Visitors to the site will learn about everything the community has to offer, and are able to view images from the latest photo shoot and watch recently created videos that showcase the community and its residences. The site provides an ideal way for prospects to visualize the rewarding lifestyle at this welcoming community. 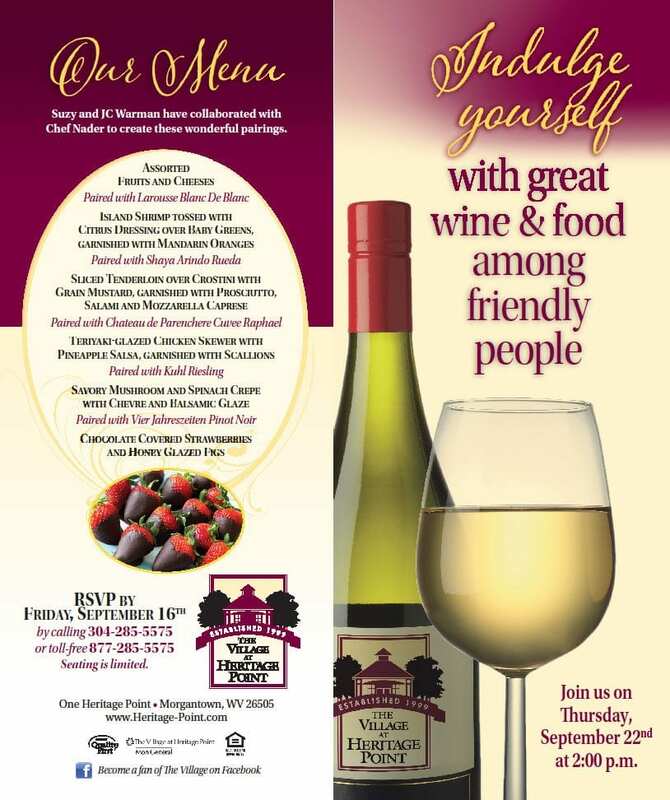 We create direct mail for The Village that promotes the friendly environment at the community, as represented by this recent Wine Pairing invitation. Not only was the event itself a success, the response was one of their strongest ever, with more than twice as many RSVPs as the event could accommodate. 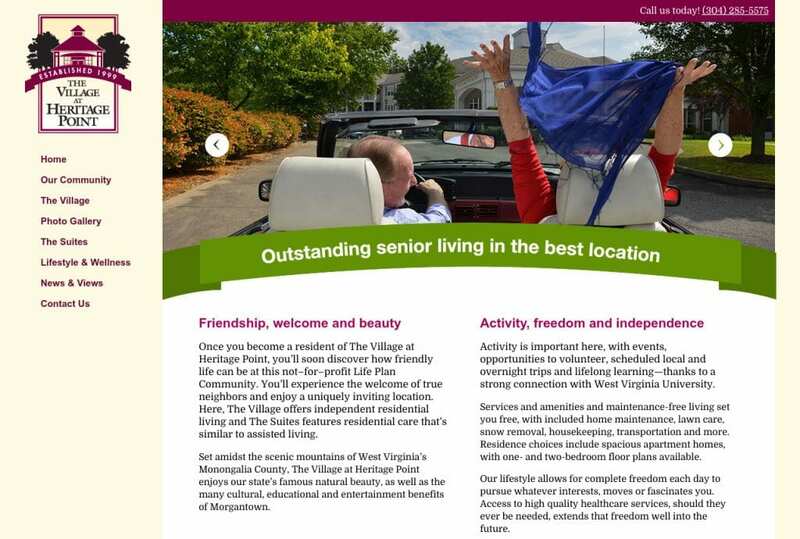 We designed a three-ad series for The Village that highlights the many services and amenities offered at the community. Each ad is geared toward a different audience, but all work together as rotating ads placed in local publications. We worked closely with the community to incorporate key selling points that were determined as part of a community-led brainstorm. The Village at Heritage Point has worked hard over the years to keep their census at or above goal. We are pleased to assist them by creating effective marketing materials that keep their lead generation consistent and prospect pipeline active.